So, Draco, does it bother you at all that your daughter brought home two guys she had absolutely no intention of marrying? Of course it doesn’t… silly me. I’m not sure what’s going on here, but I think Phoebe has a bit of a crush on the maid. She’s always trying to chat him up and keep him from doing his work. Here, she’s obviously given him a front seat ticket to the gun show, but all he can think about is shiny cookery. Seriously? Oh, Aludra… aren’t you supposed to be at work? What’s with the outfit change? …Are you serious? I don’t remember hearing any chimes! That dastardly bugger, even in death, he’s managed to produce offspring! As if sensing that Aludra’s belly popped and his deed was successful, Manchu pops up for a romp around the house. Apparently, Noémi didn’t get the memo and is rather shocked. I see you’ve met Manchu. You can thank your daughter for this one, she’s keeping his urn in her bedroom. Bao is either completely oblivious or sneakier than I had imagined. I still have him working almost around the clock on his painting, but he finds ways to sneak off when I’m distracted. You know that’s not yours, right? Grumble. He’s probably just hoping Manchu fails to deliver an heir/heiress and wants to be called up to bat. I know I forgot to list Bao’s stats, so I’ll do so now. I’ll be changing his LTW, since it’s something I’ve already finished, so I won’t list that yet. It’s worth noting that Bao moved in at the beginning of the Adult life stage. Noémi the newly turned elder falls victim to Phoebe’s complete and utter lack of humor. Seriously, most people Phoebe tries to talk to end up sacked out on the floor. 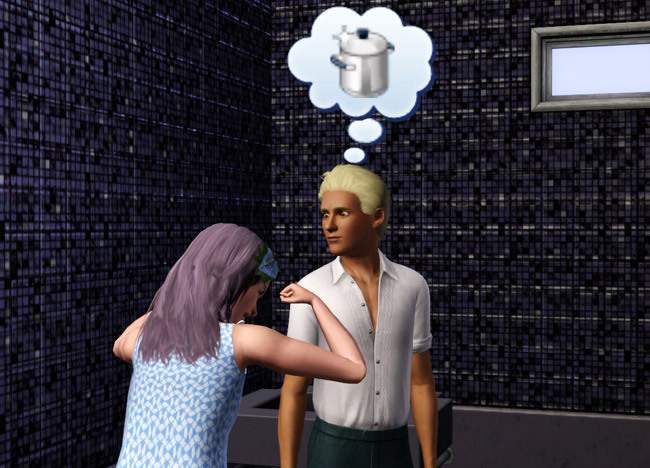 I couldn’t imagine having to actually play a sim with No Sense of Humor, I’m pretty sure it’d drive me insane. 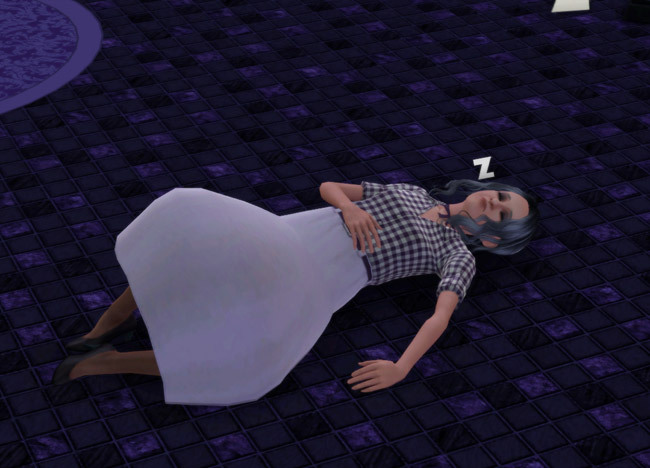 Quick as a flash, Aludra’s labor pains start and it’s off to the hospital. Home births give better starting relationships, but I figure Aludra doesn’t care about things like that. Wow, such a calm, stoic demeanor for someone in labor. Aludra gives birth to TWO freaking ghost babies. TWO! How in the hell is that even possible? One, Manchu was alive when they got busy… two, HOW DID I END UP WITH TWO? Auuughhh! Ghost babies can’t be heir… damn it. I’ll have to try to get some Ambrosia if one of these actually has what it takes to be heir. Instead of looking in on the tiny plants of the his seed, Manchu opts to instead play video games… all night long. Arghh! You are driving me insane, Manchu, even in death! How did I end up with TWO GHOST BABIES? Taking care of translucent babies is a tough job, but Aludra and Draco seem equipped to handle it. Bao sometimes peeks in, but I have him busy on Paint duty with a side of LEARN TO GARDEN–NOW! As you can see, Draco is also an elder. Given all the chaos, I’ve been terrible at getting transition pictures! Phoebe, however, is not digging the ghost babies at all. Yeah, I’m pretty sure that came up when she was birthing them, Phoebe, but thanks for the update. 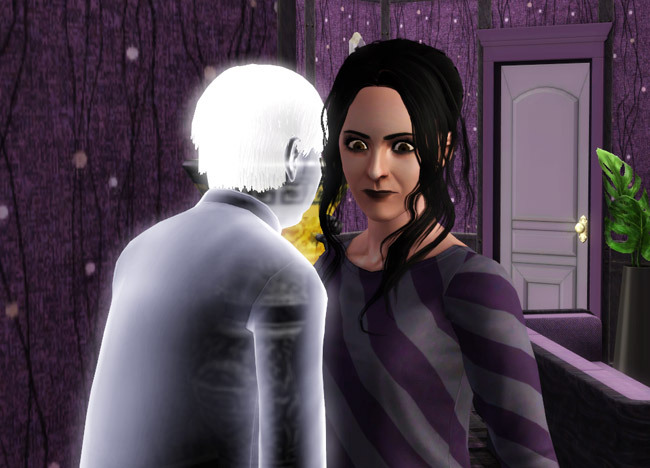 The ghostly pair become creepy toddlers. It’s worth noting that I’ve never had ghost babies before nor have I ever had the desire. Why? Well, they’re completely translucent, so they have no visual “characteristics” and I figured that ghost track would drive me nuts. Guess what? I was right. It’s driving me insane! I make sure the radio is loud so I can’t hear the stupid noises. 8 comments to Generation Five: Who Ya Gonna Call? The maid looks a tad deranged in that second picture. Dude’s got crazy eyes! Ugh, the ghost babies make those regular ghost noises? How irritating. I don’t even keep graves on my lots in either game, in part because of those noises! That’s a shame Pollux and Sirius are ghosts because they are really cute, especially Pollux. Ambrosia is such a pain. I can get the death fish okay but I’ve never managed to get life fruit! More inappropriate “teach to talk” topics! I wonder if that’s affected by their traits at all. It certainly seems to be, with Aludra talking about groveling! The ghost noise is seriously driving me up the wall! There is no escape! I wonder that, too. Aludra is always talking about evil stuff anyways, it must just transfer over. This is very interesting. I thought she would have normal babies even though Manchu is a ghost. 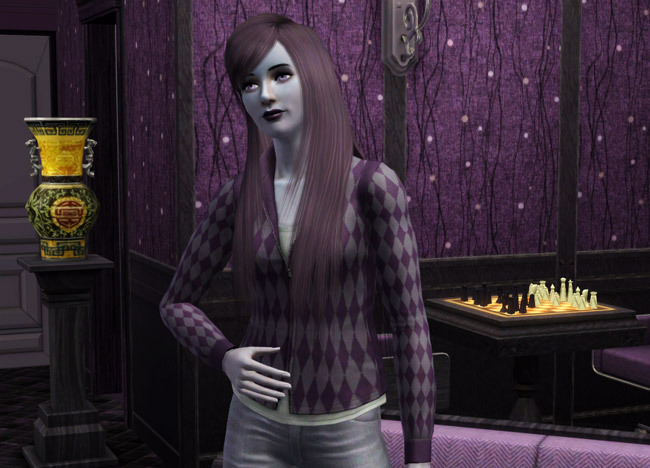 But, ghost babies does look suit her evilness I have been wondering about ambrosia and googling to find out if it can really bring back ghost sims to normal. I guess this update has already answered my questions. Thanks. 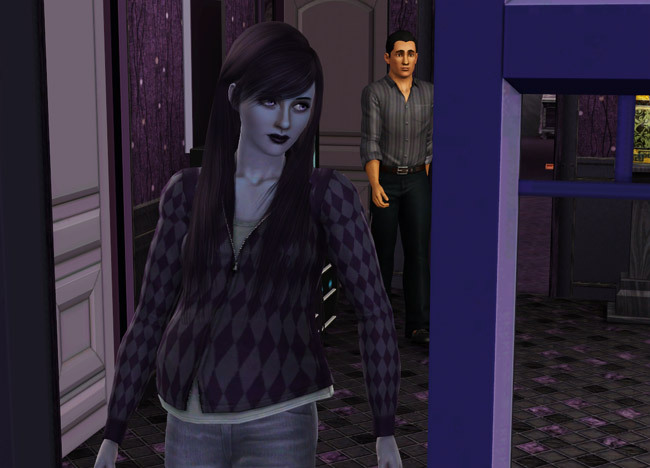 Oh my 2 baby ghosts, i have never had ghost babies, but somehow they totally suit for their ‘interesting’ evil mum hehe…. Totally cool update! It is very fitting for Aludra, at least there’s always that! Thanks! Okay, what. the. heck. He wasn’t even dead when they woohoo’d! Ew, or was me!? Maybe it was a peri-mortem woohoo. Yuck, Aludra! I didn’t know you could have ghost babies in this game…the concept is kind of neat, but are you saying that a ghostly soundtrack plays the entire time ghost babies are present? Please tell me Maxis was not so incredibly stupid as to make this so. 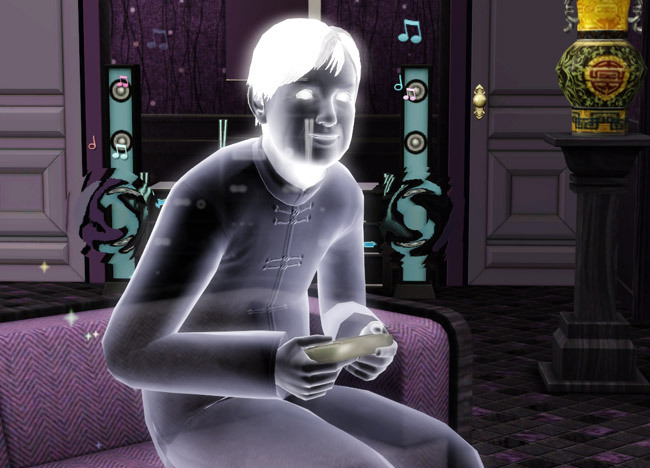 I can barely stand the sound effects for one full night of haunting in sims 2; I’d go nuts if I had to listen to it perpetually in a legacy household in sims 3! Boy, Draco aged roughly, didn’t he? Good thing Noémi is around to keep things straight. Draco looks like he’s ready to wander around confusedly through his elderhood. Looking forward to seeing how the ambrosia works! I have no idea what happened. I think maybe, MAYBE the game flagged him as dead as soon as they arrived at the hood, that’s a possibility, given how the whole glitch works. And yes, the ghost soundtrack plays CONSTANTLY. Ugh. Poor Draco. His beefy arms will be missed!